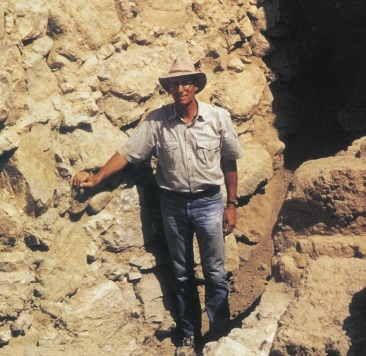 Dr Wood stands at the base of the stone retaining wall uncovered by Italian archaeologists at the southern end of Jericho in 1997. The Israelites marched around this wall when they attacked the city as described in Joshua 6. The name ‘Jericho’ brings to mind Israelites marching, trumpets sounding and walls falling down. It is a wonderful story of faith and victory, but did it really happen? However, a careful examination of the archaeological evidence collected throughout this century leads to quite another conclusion. Before the Israelites entered the promised land, Moses told them that they were now about to cross the Jordan river, to dispossess nations which were greater and stronger than themselves, with large cities having walls that reached, as it were, to the sky (Deuteronomy 9:1). The meticulous work of Kenyon showed that Jericho was indeed heavily fortified and that it had been burned by fire. Unfortunately, she misdated her finds, resulting in what seemed to be a discrepancy between the discoveries of archaeology and the Bible. At the crest of the embankment was a similar mudbrick wall whose base was roughly 14 meters (46 feet) above the ground level outside the retaining wall (see diagram). This is what loomed high above the Israelites as they marched around the city each day for seven days. Humanly speaking, it was impossible for the Israelites to penetrate the impregnable bastion of Jericho. 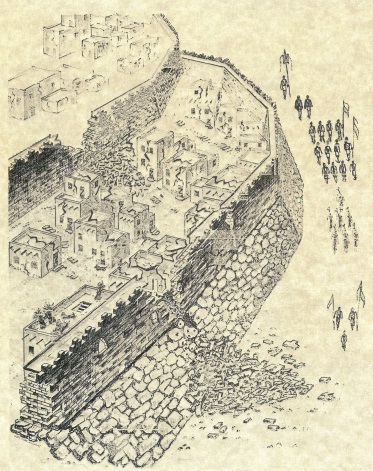 Within the upper wall was an area of approximately six acres, while the total area of the upper city and fortification system was 50% larger, or about nine acres. Based on the archaeologist’s rule of thumb of 200 persons per acre, the population of the upper city would have been about 1,200. However, from excavations carried out by a German team in the first decade of this century, we know that people were also living on the embankment between the upper and lower city walls. In addition, those Canaanites living in surrounding villages would have fled to Jericho for safety. Thus, we can assume that there were several thousand people inside the walls when the Israelites came against the city. The citizens of Jericho were well prepared for a siege. A copious spring which provided water for ancient, as well as modern, Jericho lay inside the city walls. At the time of the attack, the harvest had just been taken in (Joshua 3:15), so the citizens had an abundant supply of food. Schematic cross-section diagram of the fortification system at Jericho based on Kenyon’s west trench. This has been borne out by many large jars full of grain found in the Canaanite homes by John Garstang in his excavation in the 1930s and also by Kenyon. With a plentiful food supply and ample water, the inhabitants of Jericho could have held out for perhaps several years. After the seventh trip around the city on the seventh day, Scripture tells us that the wall ‘fell down flat’ (Joshua 6:20). The Hebrew here carries the suggestion that it ‘fell beneath itself.’5 Is there evidence for such an event at Jericho? It turns out that there is ample evidence that the mudbrick city wall collapsed and was deposited at the base of the stone retaining wall at the time the city met its end. In other words, she found a heap of bricks from the fallen city walls! An Italian team excavating at the southern end of the mound in 1997 found exactly the same thing. Illustration by Gene Fackler, based on Sellin and Watzinger4, page 13. Artist’s reconstruction of the north side of ancient Jericho, based on the German excavations of 1907–1909. Note the houses built against the mud brick city wall, which rests on top of the stone retaining wall. The Bible says that Rahab’s house was built against the city wall (Joshua 2:15). According to the Bible, Rahab’s house was incorporated into the fortification system (Joshua 2:15). If the walls fell, how was her house spared? As you recall, the spies had instructed Rahab to bring her family into her house and they would be rescued. When the Israelites stormed the city, Rahab and her family were saved as promised (Joshua 2:12–21; 6:17, 22–23). At the north end of the tell of Jericho, archaeologists made some astounding discoveries that seem to relate to Rahab. What is more, there were houses built against the wall! It is quite possible that this is where Rahab’s house was.7 Since the city wall formed the back wall of the houses, the spies could have readily escaped. From this location on the north side of the city it was only a short distance to the hills of the Judean wilderness where the spies hid for three days (Joshua 2:16, 22). Real estate values must have been low here, since the houses were positioned on the embankment between the upper and lower city walls. Not the best place to live in time of war! This area was no doubt the overflow from the upper city and the poor part of town, perhaps even a slum district. After the city walls fell, how did the Israelites surmount the four to five meter (12–15 foot) high retaining wall at the base of the tell? Excavations have shown that the bricks from the collapsed walls formed a ramp against the retaining wall so that the Israelites could merely climb up over the top. The Bible is very precise in its description of how the Israelites entered the city: ‘the people went up into the city, every man straight before him [i.e., straight up and over],’ (Joshua 6:20). The Israelites had to go up, and that is what archaeology has revealed. They had to go from ground level at the base of the tell to the top of the rampart in order to enter the city. The Israelites burned the city and everything in it (Joshua 6:24). Once again, the discoveries of archaeology have verified the truth of this record. 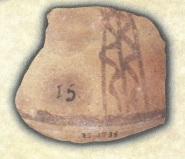 A portion of the city destroyed by the Israelites was excavated on the east side of the tell. Wherever the archaeologists reached this level they found a layer of burned ash and debris about one meter (three feet) thick. Kenyon described the massive devastation as follows. Dr Wood atop the stone retaining wall pointing to the remnants of the mud brick wall that once stood here. The wall collapsed as stated in the Bible (Joshua 6:20). Both Garstang and Kenyon found many storage jars full of grain that had been caught in the fiery destruction. 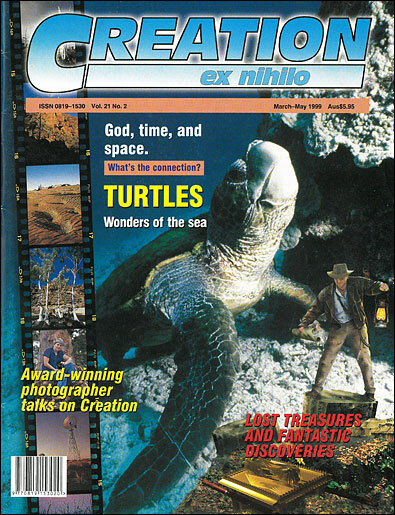 This is a unique find in the annals of archaeology. Grain was valuable, not only as a source of food, but also as a commodity which could be bartered. Under normal circumstances, valuables such as grain would have been plundered by the conquerors. Why was the grain left at Jericho? The Bible provides the answer. Joshua commanded the Israelites that the city and all that is in it were to be dedicated to the Lord (Joshua 6:17, lit. Heb.). The grain left at Jericho and found by archaeologists in modern times gives graphic testimony to the obedience of the Israelites nearly three-and-a-half millennia ago. Only Achan disobeyed, leading to the debacle at Ai described in Joshua 7. Jericho was once thought to be a ‘Bible problem’ because of the seeming disagreement between archaeology and the Bible. When the archaeology is correctly interpreted, however, just the opposite is the case. The archaeological evidence supports the historical accuracy of the biblical account in every detail. Every aspect of the story that could possibly be verified by the findings of archaeology is, in fact, verified. If God did use an earthquake to accomplish His purposes that day, it was still a miracle since it happened at precisely the right moment, and was manifested in such a way as to protect Rahab’s house. There are many ideas as to how the walls of Jericho came down. Both Garstang and Kenyon found evidence of earthquake activity at the time the city met its end. If God did use an earthquake to accomplish His purposes that day, it was still a miracle since it happened at precisely the right moment, and was manifested in such a way as to protect Rahab’s house. No matter what agency God used, it was ultimately He who, through the faith of the Israelites, brought the walls down. After the people had marched around them for seven days, it was ‘by faith the walls of Jericho fell down’ (Hebrews 11:30). As well as showing us how vital it is not to discount the Bible because of some apparent conflict with secular scholarship, Jericho is a wonderful spiritual lesson for God’s people yet today. There are times when we find ourselves facing enormous ‘walls’ that are impossible to break down by human strength. If we put our faith in God and follow His commandments, He will perform ‘great and mighty things’ (Jeremiah 33:3) and give us the victory. Kenyon, K.M., Digging Up Jericho, London, Ernest Benn, pp. 261–62, 1957. Return to text. Holland, T.A, Jericho, The Oxford Encyclopedia of Archaeology in the Near East, Vol. 3, pp. 220–24, ed. Eric. M. Myers, New York, Oxford University Press, p. 223, 1997. Return to text. Wood, B.G., Did the Israelites Conquer Jericho?, Biblical Archaeology Review 16(2):44–58, March–April 1990. Return to text. Sellin, E. and Watzinger, C., Jericho die Ergebnisse der Ausgrabungen, Osnabrück, Otto Zeller Verlag, p. 58, 1973 (reprint of the 1913 edition). Return to text. The root of the word tahteyha in Joshua 6:5, 20 is tahath, meaning ‘underneath,’ ‘below’ with a reflexive 3rd feminine singular pronominal suffix ha referring back to hômah, ‘wall.’ Return to text. 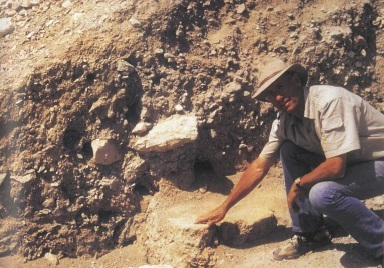 Kenyon, K.M., Excavations at Jericho, 3:110, London, British School of Archaeology in Jerusalem, 1981. Return to text. The Hebrew phrase in Joshua 2:15 is beqîr hahômah. Usually qîr means a small wall, but can also indicate the vertical surface of a wall. Brown, Driver and Briggs’ lexicon suggests this for Joshua 2:15 (p. 885), and in this case the preposition be would mean ‘against’(p. 89). 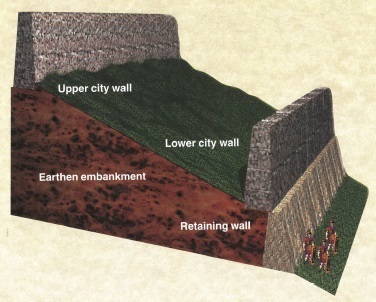 Thus, literally, ‘her house [was built] against [the] vertical surface of the [city] wall.’ Return to text.